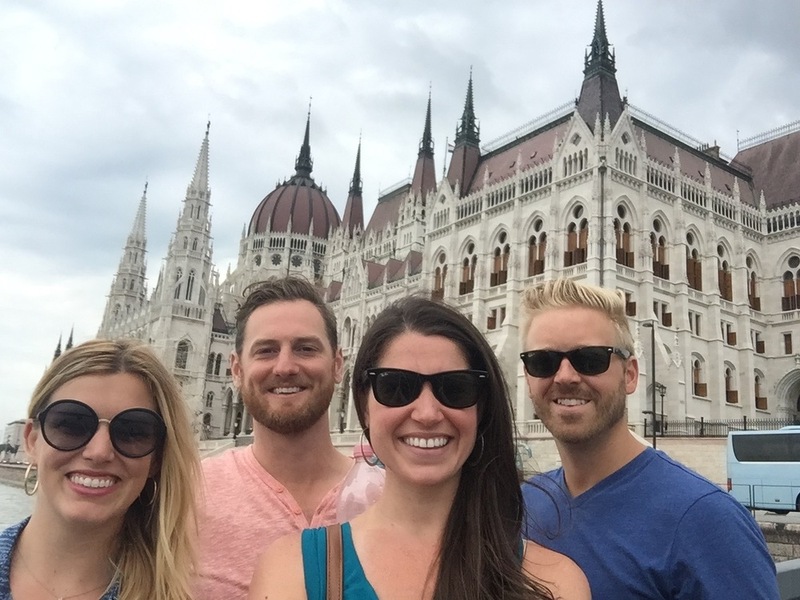 Our first day in Budapest was WARM! 95 degrees, clear blue skies and sweat running down our backs for days! Spending our first full day in the city at the Szechenyi Thermal Bath and Swimming Pools was exactly what we needed and for me was definitely one of the highlights of our visit to Budapest. And what... a... riot! The bath was something like out of a movie: people everywhere having drinks, watching football on the big screen, laying in the sun and playing in the whirlpool. There were indoor pools and thermal tubs for lounging and outside there were three larger pools (both cold and hot) where we spent an entire afternoon just relaxing. After the pool (and a few cocktails) we were ready for some quick nourishment and stopped at a small vendor just outside the pool entrance in the park where they served Langos - a Hungarian food specialty of deep fried flat bread traditionally served with garlic sauce and cheese. It is the savory version of an elephant ear and is incredible! When in Hungary, eat a lango. In addition to the lango, the local cuisine also includes Hungarian Goulash and Soup - both of which we all enjoyed multiple times. The goulash in Hungary is NOT your momma's goulash. Forget about Hamburger Helper and think more sweet paprika stew with cubed steak. As soon as we got home I searched for and made a crockpot version of their goulash and was unfortunately thoroughly disappointed - it just wasn't the same. We also did a bit of shopping while in the city and visited the Great Market Hall where we found two enormous floors of vendors selling textiles, souvenirs and fresh food. Had we not already eaten breakfast, we would have stopped for a bite because everything looked delicious. We did a bit more shopping outside of the market too and found some really great original pieces by local artists and designers. I found a fun poster that's now up on our wall at home. Just near the Great Market Hall is the Liberty Bridge that crosses the Danube River. We stopped for a couple photos and kept walking along the river and passed the Szechenyi Chain Bridge (an iconic 1800s suspension bridge) and even further, the Hungarian Parliament Building. 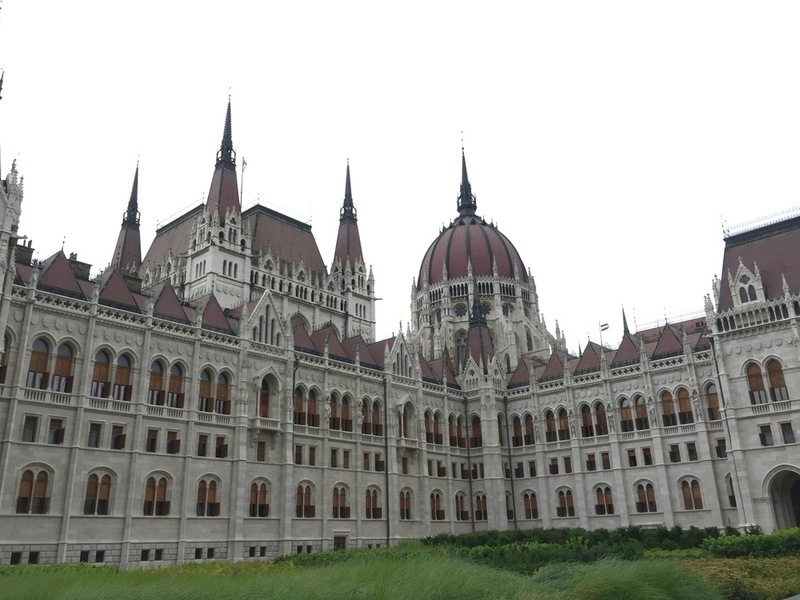 The parliament building is the largest building in Hungary and the tallest in Budapest and is quite the sight. We spent some time walking around the giant building and watching the changing of the guard which was more like a dance than anything else. And in true tourist form, we took a selfie with one of the guards. We were all embarrassed of ourselves. As previously mentioned in the other Eastern Europe travel blogs, the Eruo 2016 was in full swing while we were in town. After dinner our second evening in town we grabbed a few beers from a vendor and joined the locals to watch watch football on a giant screen in one of the many green parks downtown. It was a little taste of local life and fun to be a part of an atmosphere we don't get here in the U.S. Similar to the other three cities on our trip, Budapest also had a great Jewish Quarter which is also where our AirBnB was located. Within a one block radius we could find coffee shops, ruin bars that opened once it got dark, shops and street markets, and there were even a few hostels just near our place. There was plenty of action and a fun neighborhood to explore. Our final day in Budapest was a bit of a surprise... for the first time we flew Air Berlin and were disappointed when at the last minute they cancelled our flight home. A few phone calls later and we were rebooked on the same flight the following day leaving us another full day in the city. Our disappointment was soon replaced by one of the most relaxed and romantic days we'd experienced on our trip yet. After a very late night (our driver was originally scheduled for a 3am pick up time) of phone calls to rebook flights, reserve our apartment for an additional night, calling our families to ask for free grandparent childcare for one more day, and informing our offices... needless to say, we slept in the next morning! But our final (bonus) day in the city did not go to waste! Having already toured most of the city, we decided to take our own ruin pub crawl. Ruin Pubs are very common in Budapest and usually consist of vacant lots with tarps for roofs and/or shipping containers where they serve food and drink. And the best part? Because it was middle of the afternoon on a Monday, we had no problem getting service! On our final-final evening in the grand city that is Budapest, we chose a formal dinner aboard a river boat docked on the Danube. Our meal overlooked the Buda Castle opposite the river of us as the sun set over the city. We rehashed memories from the days before and cheers'd to another successful european holiday together.